Showing results for tags 'scenery'. Although the Protectors of the Candle are responsible for maintaining order and security in Port Stellis, it hasn't always been their only duty. When the town was still young, the Protectors of the Candle operated both inside and outside the city walls. Groups of soldiers patrolled the wild land around the Port Stellis and had to hunt down the marauding beasts they found in their path. But the task quickly turned out to be complicated: Ulgu's mists and illusions misled several patrols, some of which disappeared forever, while the wandering creatures were sometimes far too formidable to be killed by a simple group of patrollers. Since that time, the Protectors of the Candle have stopped making patrolling rounds outside, focusing on security and order inside the city. There are still some lone hunters and loose members of the Candle, who roam in the wilderness. Most of them of them are antisocial and reject the comfort of the city. Apart from those, the Stormcast Eternals are now the ones in charge of patrolling outside the city and slaying the mist monsters. However, the watchtowers built by the Protectors of the Candle are still there. There are a dozen of them, usually located at one or two leagues away from the city. Some are still in good condition while others are dilapidated due to lack of maintenance. Nowadays they are mainly used by hunters and travellers who seek temporary shelter. And lastly, an amusing anecdote: although the Protectors of the Candle no longer patrol beyond the walls, they have never officially given up on this mission. This means that the city watch can at any time order soldiers to patrol the hostile wilderness of Ulgu. In fact, Commander Isilde Brumehaut sometimes uses this excuse to punish troublemakers in her ranks: unruly soldiers are ordered to go up in one of the watchtowers outside the city, under the pretext of strange activities in the area in question. This is obviously a false reason because strange things happen all the time in the Shadow Realm. That said, the prospect of spending an entire week, shivering in the cold and hearing strange whispers, inside a solitary tower surrounded by thick haunted fog is usually enough to discipline any hard-headed soldier. Brayherd Herdstone. Scratch built using a piece of Driftwood. 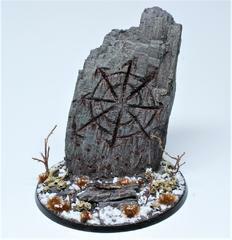 I've been looking through the web for good basing materials: so, crystals, flowers, sculpted bases, anything Thoughts? Hello guys. 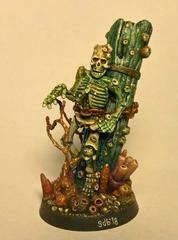 I saw some awesome painted miniatures in this forum section. I just started the hobby and i want to go all the way baby! 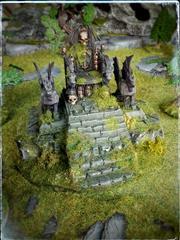 Painting, scenery, battles, skull for a skull throne and stuff. So i got few questions about finishing bases and/or scenery. Sand and rocks! Yeah- where are you getting them. 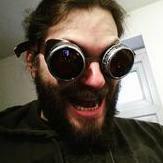 I mean do you buy things like: https://www.darksphere.co.uk/p.php?p=30443 or https://www.darksphere.co.uk/p.php?p=72812 or you are basically using a Citadel texture paints... Or I don't know maybe DIY stores??? Hey guys! 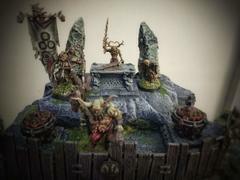 Looking through the last White Dwarf, I saw an awesome paint job on some of the Chaos scenery. I've been asking around, and trying to work out how it was done, but no-one seems very sure. Might any of you hobby-heroes be able to help me out? Thanks! I propose gathering and discussing all the info on the subject here, as it's a very important one. And, not surprisingly, it crops up everywhere. It saddens me that there are people who can imagine a good game without some landscape. It's one the things that comprise the heart of the hobby, not only playing, for the miniature is only then fully alive when it participates in some diorama,even if a small one. 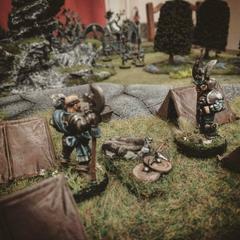 Even if you minis just line up on the shelves or a display board, some scenery around and preferably a scene of some sort make them truly come to life, even more so on the tabletop. It's third stage of the whole process - you paint the figure first, then make some base for it second, and finally send into some action of any sort, also on a battlefield. There is certainly the difference between the bare table or bare shelves and one dotted with terrain, anything you like. After all, even some improvised one is better than nothing, and it's not hard to make good one or buy something suitable for your vision of the hobby. Here are some examples of good scenery what do you all think? 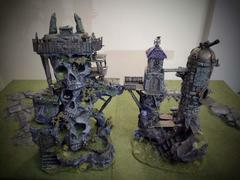 Does anyone know of a supplier (preferably UK based) of resin accessories suitable for terrain projects? 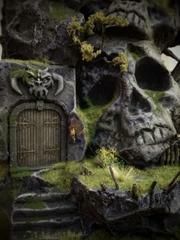 I'm specifically looking for things like medieval/fantasy doors, windows, etc that can be applied to the surface of scratch-built buildings. I’ve been working on some Tzeentch scenery: specifically, the tzaangor equivalent of a herd stone. In the Disciples of Tzeentch battletome, it mentions that Tzaangor warflocks use them to harness the magical energy of the locale, and use it to further the cults position. The obelisks were sculpted, and the three pillars are from a Lord of the Rings set. These aren’t quite finished, I’m going to tidy up the dry brush. Thanks for looking! This was very much a fun little aside from painting models. It goes together fast and you can have a lot of fun with bright colours, washing and drybrushing. My next task is to come up with some variants on this. I played my first game with the Maggotkin Battletome yesterday and I got plenty of trees out. I'm not sure you need any more than 3 or 4, but it would be nice to have some variation. 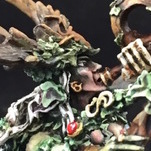 I think I can afford one more of the official model which I can convert with some Sylvaneth parts, and then use a couple of sylvaneth trees which can be put on a same size base and then modded with mouths, pustules and bells to represent a Gnarlmaw. scenery What about all the cool scenery??? So I was looking through the app, and saw a lot of cool old scenery pieces... It seems like there were more to choose from before AoS... I didn't count them, but a lot of the older models looked really cool. I especially like the Chapel. Anyways... 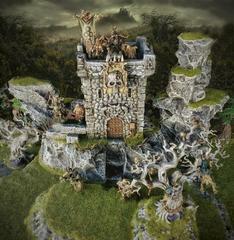 Does anyone know, whether or not we will be seeing more scenery models than the current handful of pieces? It seems a bit inadequate! Cheers! 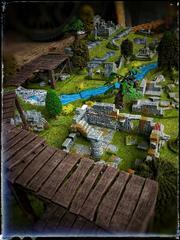 I've long been an admirer of the Table Top World terrain - it always appears to be excellent quality and well detailed terrain. Some of it is very expensive, but they have a few pieces that are more reasonably priced, and one of these is the Windmill. It turned up quickly and was well packaged, with all the pieces securely packaged inside the main building section. The casting quality is very good as well, and there was barely any clean up needed. I had a plan for the base that I wanted for the windmill, which was to place it onto a step which was surrounded by some of the excellent ribs from Gary M on Twitter. You can see here how it would be situated. It was important that there was a lot of space around the windmill as I had a little plan for it, so raising the height seemed like a good idea. In the photo below you can also see some the other death terrain pieces in their earliest stages and showing how I generally lay out terrain at the beginning of the process. Once I had cleaned up the Windmill I started on the conversion process. I ordered a very small motor from Pimroni that had a rotational speed 14 rpm. These come pre geared so all you need to do is add a battery pack to them. I ordered a 6amp circular battery holder from Ebay to power the motor and this was attached simply using a few wires and a terminal block. It didn't matter which way the batteries are connected to the motor - all this does is change the direction the motor spins, so you really can't go wrong. Mounting the motor inside the windmill was slightly more challenging. The top of the windmill is cast separately which is a good start, however I had to drill out the hole for the spindle to go through. I replaced the spindle with a small piece of wooden dowel which I drilled on a centre lathe to ensure the holes were located accurately. I drilled a small hole all the way through so that the sails could be mounted and pinned to one side and the other could be pushed on to the spindle of the motor. I then mounted the motor on some hard board and glued it into the top of the windmill. Once I'd done some testing to make sure that everything worked well I glued a ring into the top of the windmill to allow that to be rotated as well. To paint the windmill I used some spray paint and gave the whole thing a few cots of dark grey, light grey and white to pick up a lot of the raised detail. I sprayed the top brown, and didn't worry too much about over spray on this as it would just add a bit of variation on the stone. Once it was dry I washed the whole thing with various different colours and made sure to dry brush the whole thing. This picked up all of the great texture on the model . I was able to selectively wash various stones with blues, green and browns which just adds a nice amount of variation on the piece. I then carefully sprayed the windows with a bright acid green paint to do a glow effect. The Sails had to be painted by hand and took a bit of time, but I didn't spend a great deal of effort. Once this was done I was able to finish mounting the model onto its base. Overall I was happy with the colour scheme and the overall look, and hopefully it will be well received by players at the event this weekend.